Seas W16NX001 E0049-08 Woofer is a Seas Excel 5" 8 Ohm Woofer with a precision cast magnesium cone and natural rubber surround. The large magnet system with bumped back plate makes room for extreme coil excursions, and heavy copper rings mounted above and below the T-shaped pole piece reduce non linear and modulation distortion and increase overload margin. A product datasheet can be downloaded from the Product Description page. 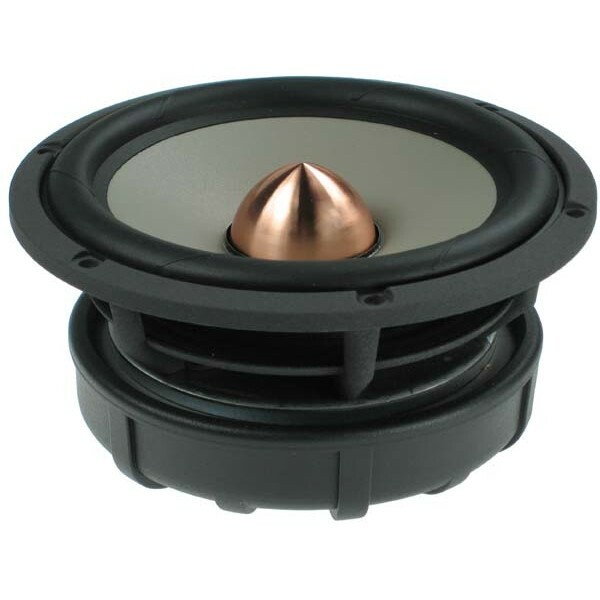 A copper phase plug reduces compression due to temperature variations in the voice coil, increases long term power handling capacity and eliminates resonances in the cavity inside the voice coil former. An extremely stiff and stable injection moulded metal basket keeps the critical components in perfect alignment, and large windows in the basket both above and below the spider reduce sound reflection, air flow noise and cavity resonance to a minimum. A Product Datasheet can be downloaded by clicking on the appropriate .pdf logo (where shown).